York’s National Railway Museum was the setting for Total Transport North 2015, a conference dedicated to securing the future of transport in northern regions. Ten local authorities who have all made successful bids for the government’s Total Transport Pilot fund came together for the event. The Total Transport project is aimed at pooling public transport resources, coordinating them to better meet resident’s needs. Chris Peat attended to hear what their plans and ideas for the future of transport are. Opening proceedings was Under Secretary of State for Transport, Andrew Jones MP, who started by saying buses are essential in rural areas. Announcing his belief that Total Transport is the transport solution the country needs, Andrew said that the way all those involved, from operators to local authorities, work together will play a key part in how it takes off. Collaboration is needed to deliver it. Encouragingly, Andrew described the bus sector as the bread and butter of public transport, describing it as an ‘incredible driver’ in linking people both economically and socially. He described buses as affordable, saying they are a lifeline to many. Despite their crucial role, he was struck how variable the level of service is across the UK. Citing the recent Transport Focus report saying satisfaction in bus use was up, he admitted that in rural parts there is a completely different story. He has ‘real concerns’ over this. For local governments, he said it is not easy to provide buses. With many services requiring subsidy, the problem is exacerbated by the fact there is ‘great pressure’ on local government finance. However, devolving bus funding to local authorities, he claims, has worked well and could help solve the problem. Andrew said the Government is bringing forward the Bus Bill, which he said will give individual areas the capacity to have a greater influence over local buses. The plans are already on their way in Greater Manchester, Sheffield and Cornwall and he says such powers have proved very attractive. The Bill is expected to be introduced soon, ‘within weeks rather than months’. 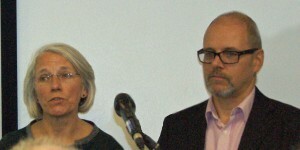 (LtoR) Gill Bridgeland from Gloucestershire CCG and Andy Jennings from Wiltshire CCG. Outlining what Total Transport is all about, Andrew said that not everyone has access to a car, but everyone should have access to public transport. This is often delivered by different operators, but he said the onus of the project is integrating these services, making better use of them. The aim is to allocate existing services to meet individual transport needs, it is not about who provides it. He claimed funding for public transport is not coordinated at the local level, meaning there is some potential wastage of funds. ‘We can’t afford to have any level of waste,’ he said. Total Transport has had broad support, claims Andrew, saying the Transport Select Committee believes it could very well benefit communities. A range of pilot projects for the scheme are now being run and Andrew has been encouraged by the amount of people that have embraced the idea, describing it as something that should have been developed a while ago. There are challenges though, he admits, saying it will not be easy to work through the ‘structural barriers’ that exist between organisations that organise the various transport offerings. It will require a number of organisations to think about their existing policies and how they will work in a more integrated transport network. He described it as a case of more collaboration between different teams and the pooling of funding, not a restructuring of councils. ‘It is up to local people to deliver it though’, he said, ‘it is them who have to decide whether they want to make it work’ adding ‘it is an ‘exciting time’ for the bus industry’. 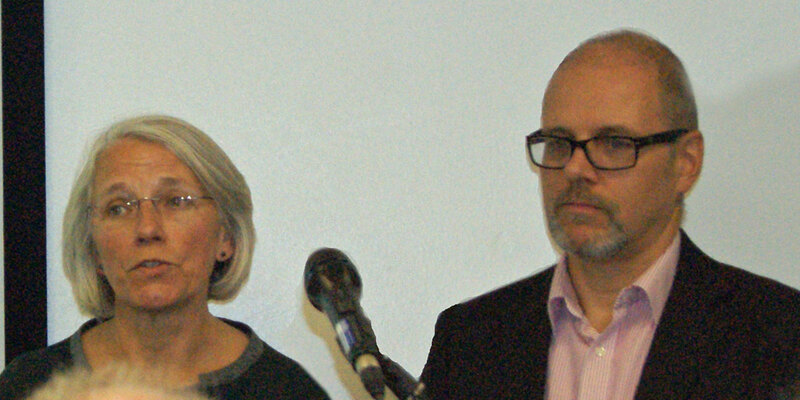 Next to speak was Gill Bridgeland from Gloucestershire Clinical Commissioning Group (CCG) and Andy Jennings from Wiltshire CCG, who looked at how Total Transport can help them meet their objectives. The two organisations commission health care transport. Funding for healthcare travel is a scarce resource, Gill claimed, so it can only be arranged for those who really need it. However, she says she finds her provider doing multiple journeys with near empty vehicles. She said there is also more that needs to be done to improve hospital flow, with the shortage of beds requiring a faster turnaround of patients, which itself means better transport is called for. More efficient use of these finite transport resources is required, she believes, with empty vehicles used more wisely. The benefits will include reduced waiting times, reductions in empty mileage, improved hospital flow and less competition between CCGs and Councils for taxi resources. 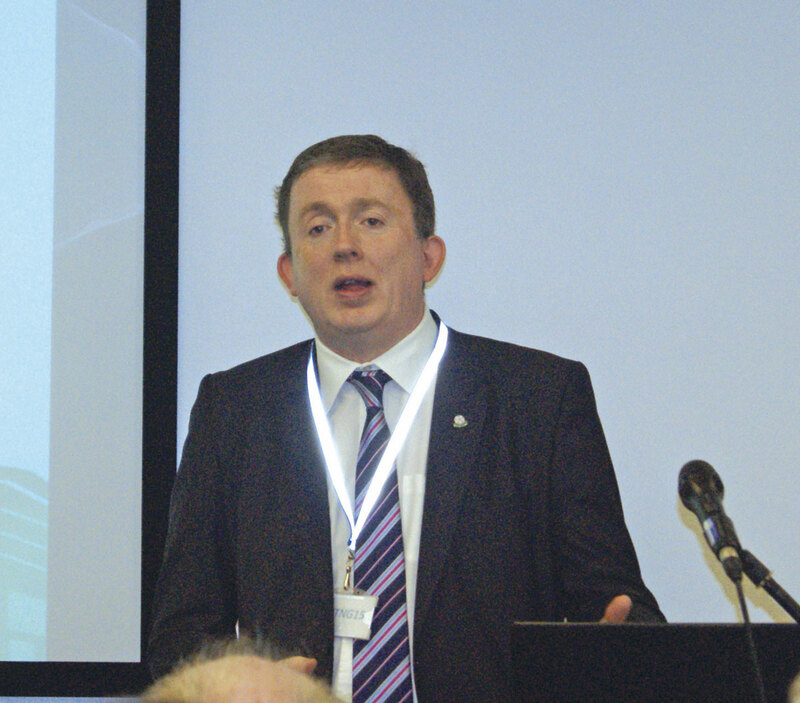 David R Boden, Group Manager – Transportation Services at East Riding of Yorkshire Council. between transport providers and local authorities was one thing he mentioned, saying it is something that has not been taken on in some areas, but in the north there are a few successful examples. David said we have to achieve ‘real tangible deliverables, something real’ with Total Transport. One of the ways he envisages this can be done is through smarter, more integrated health transport and by creating a ‘one stop shop’ for all transport needs. He said the funding for this need not be ‘new money’, suggesting existing funds should be used more imaginatively and creatively. All those involved in Total Transport in the north are, in David’s words, all ‘passionate and resolute’ about delivering this. ‘We all have bids to work on and failure is not an option,’ he said. Following David’s speech there was a questions section. It soon became clear that there were real concerns for integrating not just healthcare transport, as was heavily mentioned in the presentations, but also with other forms of transport, such as school buses. In response to these, Andrew Jones said the pilot projects should identify any issues with integrating transport and should be used to try to remove any barriers and difficulties. One of those questioning the panel was Peter Shipp, EYMS (East Yorkshire Motor Services) Chairman, who said he did not share Andrew’s view that it is an exciting period in the bus industry, it is rather a ‘worrying’ time. He asked whether a more integrated healthcare transport service could be extended to visitors and staff to hospitals. He said EYMS already provides discounted travel for staff to hospitals. Further roll out of these types of project could help support the ‘under threat’ bus network, he suggested. Andrew Jones said the key thing that will drive growth in the industry is for operators and councils to work in partnership. This could possibly include further introduction of hospital staff discounted services, amongst other benefits. He said it is about increasing passenger numbers and bus services claiming the whole agenda of devolution is that it is a ‘ground up’ movement, not ‘top down’. Whilst delegates went into seminar groups to discuss their projects, I spoke to Peter Shipp about the issues raised. He said that he welcomes what the DfT has tried to do to reverse the decrease in passengers, but was not so much a fan of the Treasury considering the cuts in funding. He certainly thinks that closer working of transport providers is something that needs to be looked into. One of the barriers he sees is difficulty in engaging with all those involved in transport. He gave the example of one of the transport boards he is a part of that no longer has a healthcare representative. 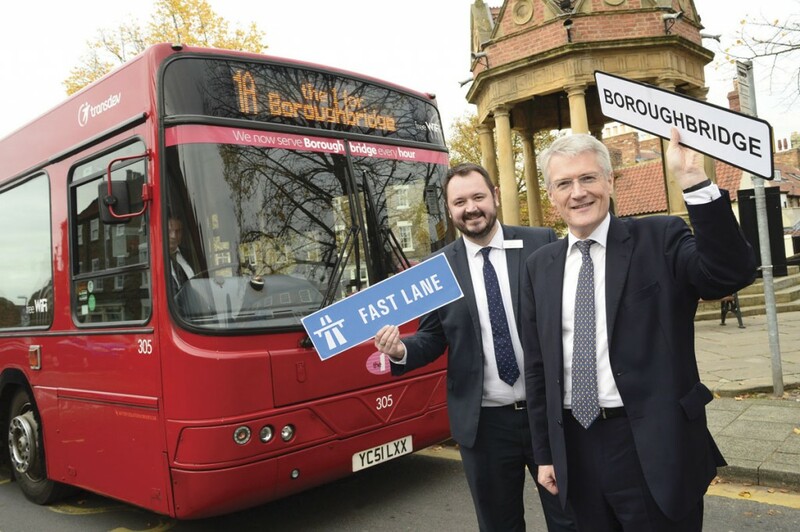 (LtoR) Transdev Blazefield Chief Executive, Alex Hornby and Andrew Jones MP promoting the new Boroughbridge service launch. Whether or not you share Andrew Jones’ sentiment that this is an exciting time to be in the bus industry, or whether your thoughts are more in line with Peter Shipp’s ‘worrying’ outlook, it is certainly safe to say it is an interesting time for operators and all those involved. Total Transport and the Bus Bill all have the potential to dramatically affect the way bus, community transport and other travel services are delivered. It is up to individuals involved as to exactly how this will take affect.